Typically, Bin There Dump That delivers dumpsters to homes throughout North America. Customers will dictate if it's going on the left or right side of the driveway; however, what makes Bin There Dump That residential-friendly, is the ability to fulfill special dumpster rental requests for customers.. 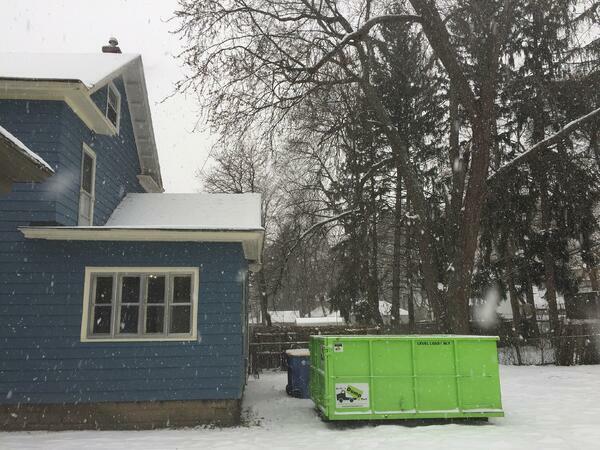 These special requests aren't the norm but they do happen as homeowners have circumstances or obstacles that dictate a specified placement of the dumpster. Bin There Dump That, 99 times out of 100 will accommodate these requests, we'll take a look at three of them. So, if homeowners are considering other options because the dumpster needs to access an alley or the dumpster needs to be placed tight to he house, outside a window or the truck needs to avoid low-hanging wires or a basketball net, well, you better continue reading. If your reside in an area in the country, where your lot backs out into an alley, you're first inclination may be to think that you will be unable to rent a dumpster. How can these massive trucks, with equally large dumpsters fit down an alley? Well, for companies that operate using tri-axle trucks, this is typically not possible. Those vehicles are too large. Bin There Dump That prides itself on being residential-friendly, which means smaller vehicles that can navigate in tights quarters, like through small alleys; we do it all the time and welcome the challenge. You have nothing to worry about. Often, it's a much tighter squeeze than we anticipate but because our dumpsters have the footprint of a minivan, you can confidently assume we won't ding your basketball net, hit the low-hanging telephone wires and/or branches. It is in your best interest to notify us of any special requests in the dumpster ordering form, as seen in the Charlotte and Grand Rapids franchise examples. How Close Can You Get the Dumpster To My Second Story Window? All that junk is up on the second story you say? Sure, you could bring all of it downstairs and walk it into the walk-in double doors, but that's not a lot of fun right? Rather, let experienced Bin There Dump That Dumpster Delivery Experts neatly place the dumpster right up to the house and window, so it's bombs away for you! We love fulfilling these requests because we know how more convenient it makes your dumpster rental; we always strive to achieve ultimate convenience. Don't let your home obstacle or circumstance prohibit you from renting a dumpster. Speak with your local Dumpster Consultant or specify your requests on the dumpster ordering form and allow Bin There Dump That to take care of the rest.